Objective To evaluate whether invasive coronary angiography or computed tomography (CT) should be performed in patients clinically referred for coronary angiography with an intermediate probability of coronary artery disease. Design Prospective randomised single centre trial. Setting University hospital in Germany. Participants 340 patients with suspected coronary artery disease and a clinical indication for coronary angiography on the basis of atypical angina or chest pain. Interventions 168 patients were randomised to CT and 172 to coronary angiography. After randomisation one patient declined CT and 10 patients declined coronary angiography, leaving 167 patients (88 women) and 162 patients (78 women) for analysis. Allocation could not be blinded, but blinded independent investigators assessed outcomes. Main outcome measure The primary outcome measure was major procedural complications within 48 hours of the last procedure related to CT or angiography. Results Cardiac CT reduced the need for coronary angiography from 100% to 14% (95% confidence interval 9% to 20%, P<0.001) and was associated with a significantly greater diagnostic yield from coronary angiography: 75% (53% to 90%) v 15% (10% to 22%), P<0.001. Major procedural complications were uncommon (0.3%) and similar across groups. Minor procedural complications were less common in the CT group than in the coronary angiography group: 3.6% (1% to 8%) v 10.5% (6% to 16%), P=0.014. CT shortened the median length of stay in the angiography group from 52.9 hours (interquartile range 49.5-76.4 hours) to 30.0 hours (3.5-77.3 hours, P<0.001). Overall median exposure to radiation was similar between the CT and angiography groups: 5.0 mSv (interquartile range 4.2-8.7 mSv) v 6.4 mSv (3.4-10.7 mSv), P=0.45. After a median follow-up of 3.3 years, major adverse cardiovascular events had occurred in seven of 167 patients in the CT group (4.2%) and six of 162 (3.7%) in the coronary angiography group (adjusted hazard ratio 0.90, 95% confidence interval 0.30 to 2.69, P=0.86). 79% of patients stated that they would prefer CT for subsequent testing. The study was conducted at a University hospital in Germany and thus the performance of CT may be different in routine clinical practice. The prevalence was lower than expected, resulting in an underpowered study for the predefined primary outcome. Conclusions CT increased the diagnostic yield and was a safe gatekeeper for coronary angiography with no increase in long term events. The length of stay was shortened by 22.9 hours with CT, and patients preferred non-invasive testing. We investigated the comparative effectiveness of cardiac CT and coronary angiography in patients with suspected coronary artery disease and atypical angina or chest pain who were clinically referred for coronary angiography. We assessed the impact of CT on procedural complications, diagnostic yield of invasive coronary angiography, length of stay, radiation dose, long term clinical outcomes, and patient acceptance. This study (Coronary Artery Disease Management, CAD-Man) was a prospective randomised single centre clinical investigation of CT and coronary angiography. It was conducted and is reported in accordance with the Consolidated Standards of Reporting Trials (CONSORT) guidelines for non-drug trials.14 15 From 18 February 2009 to 27 August 2015 we approached consecutive patients presenting during working days from 7 30 am until 4 pm with suspected coronary artery disease and a clinical indication for coronary angiography on the basis of atypical presentation for study participation. Atypical presentation was defined as the presence of a maximum of two of the three criteria for typical angina pectoris (retrosternal chest discomfort, precipitation by exertion, and prompt relief within 30 seconds to 10 minutes by rest or nitroglycerine) using a clinically relevant classification of chest discomfort.16 We used the Duke clinical score to assess the pretest probability of coronary artery disease.17 Patients were excluded according to the study protocol (see appendix A) if they had two positive test results for ischaemia, were not in sinus rhythm, had signs of myocardial infarction (persistent ST segment elevation, creatine phosphokinase-MB >24 U/L, or pulmonary oedema due to ischaemia), refused or were incapable of providing informed consent, could not hold their breath for five seconds, were aged less than 30 years, or had a history of or were receiving dialysis. Cardiac CT was performed and evaluated as described.24 Images were evaluated by two independent readers, of whom at least one was a board certified radiologist (MD, MR, EZ) and, as in routine clinical practice, decisions were made by consensus. In patients with heart rates up to 65 bpm, 320 row coronary CT angiography enabled reconstruction windows of 175 msec (Aquilion ONE, Toshiba Medical Systems, 121 patients) or 137.5 msec (Aquilion ONE Vision Edition, 44 patients). In patients with heart rates of at least 65 bpm, temporal resolution was improved by two beat acquisition in 23 patients and three beat acquisition in two patients.25 Coronary calcium scoring was used to individually adjust the acquisition length of CT angiography,26 27 but was not used to defer CT angiography because up to 19% of patients with symptoms and zero calcium scores might have obstructive coronary artery disease.28 Coronary angiography was performed as in clinical practice in our institution after hospital admission. A vascular closure device was used in 64 of the 186 coronary angiographies. The planned primary outcome was major procedural complications occurring within 48 hours of the last procedure related to CT or to coronary angiography and analysis was at individual patient level. The occurrence of procedural complications was checked during visits 24 and 48 hours after the last related procedure. Major procedural complications were a composite endpoint and included death, stroke, myocardial infarction, or other major complications prolonging the in-hospital stay by at least 24 hours. Minor procedural complications occurring within 48 hours of the last procedure related to CT or coronary angiography did not fulfil these criteria and were added to the comparison. A planned secondary outcome was comparison of length of stay between the two groups. We also assessed overall exposure to radiation in both study groups as a planned secondary outcome using dose-length products and dose-area products, which were converted using factors of 0.017 mSv/mGy×cm for CT29 and 0.22 mSv/cGy×cm² for coronary angiography.30 Radiation dose in the coronary angiography group included dose of percutaneous coronary intervention if done. Radiation dose in the CT group included the effective dose of CT and coronary angiography and/or percutaneous coronary intervention if performed. In addition, we evaluated the diagnostic yield of coronary angiography, defined as the proportion of obstructive coronary artery disease found in both groups by coronary angiography, and we added the reduction in need for coronary angiography in the CT group over time—with a maximum follow-up to 16 August 2016—to the analysis on request during the review process. As a secondary outcome, long term clinical events (major adverse cardiovascular events (MACE), defined as a composite endpoint of myocardial infarction, cardiac death, stroke, unstable angina pectoris, or re-revascularisation or first revascularisation) were recorded with a maximum follow-up to 16 August 2016. Re-revascularisation or first revascularisation was recorded only if occurring more than two months after randomisation.31 We obtained patients’ acceptance and preference of the procedures using a previously validated questionnaire.32 See appendix A for details of the study protocol, including all planned primary and secondary objectives and changes to the study protocol. Patients were randomised to CT or coronary angiography if a clinical referral to coronary angiography and all inclusion criteria were met. Randomisation was by a computer generated list (nQuery 7.0; Statistical Solutions, Cork, Republic of Ireland) using sequentially numbered, opaque and sealed envelopes, which were opened just before allocation to the intervention.14 Investigators and participants were blinded to the randomisation sequence but could not be blinded to the assigned group because of the apparent differences between CT and coronary angiography. Independent investigators who were blinded to the randomisation group and were not part of the study team anonymously assessed outcomes. As outlined in chapter 11 of the study protocol, we expected procedural complications of 15% in the coronary angiography group and 5% in the CT group (see appendix A). We considered a reduction in procedural complications by a factor of three to be relevant from a clinical perspective. Overall, we needed 160 patients in each group to detect these differences, with 80% power at a two sided α significance level of 0.05 using a χ2 test with correction for continuity (nQuery Advisor 7.0, Statistical Solutions, Cork, Republic of Ireland). With a conservatively estimated drop-out rate of 5%, we randomised 340 patients. Using a χ2 test we evaluated the primary outcome, procedural complications, in the entire intention to treat population, retaining participants in their originally assigned groups after excluding those who withdrew consent after randomisation. Secondary outcomes were evaluated using χ2 or t tests; length of stay and exposure to radiation were compared using a Wilcoxon rank-sum test; time to first MACE during long term follow-up was analysed using the Cox proportional-hazards model33; and the need for, possibly multiple, coronary angiography over time was compared using Poisson regression with offset observation time. We performed all comparisons using two sided significance tests; SPSS software, version 20.0, and SAS software, version 9.4 (Poisson regression) was used for statistical analysis. No patients were involved in setting the research question or the outcome measure, nor were they involved in developing plans for design or implementation of the study. All patients included in the study were asked how they experienced the diagnostic tests and to make suggestions about further improvements. The results of the research will be reported to the study participants, and the DISCHARGE (Diagnostic Imaging Strategies for Patients with Stable Chest Pain and Intermediate Risk of Coronary Artery Disease: Comparative Effectiveness Research of Existing Technologies) trial team34 will consider them in planning the analysis of this multicentre effort together with patient representatives at all sites. During the study period, 739 patients with suspected coronary artery disease and an indication for coronary angiography based on atypical angina or chest pain were referred to our centre and were potentially eligible for study participation (fig 1⇓). A total of 144 patients were excluded, mostly because of two positive test results for ischaemia (67 patients) and atrial fibrillation (32 patients). The prevalence of coronary artery disease among the 144 patients with exclusion criteria was higher than in the final study population (see supplementary table 1 in appendix B). Overall, 255 of the 549 eligible patients were not randomised, mainly because of exclusion by clinicians (n=144), logistical problems (n=45), and patients declining to give consent (n=37). The prevalence of coronary artery disease among the 255 eligible patients not randomised was not significantly different from the final study population (see supplementary table 1 in appendix B). Overall, 340 patients with a pretest probability of coronary artery disease of 34.6% (SD 23.5%) were randomised to CT or coronary angiography (fig 1⇓). Of the 168 patients assigned to the CT group, one withdrew informed consent and two underwent coronary angiography per clinician request. Ten of the 172 patients randomised to coronary angiography withdrew informed consent for participation in the study. Altogether, 167 and 162 patients with complete follow-up 48 hours after the last procedure related to CT or coronary angiography were available for the primary outcome analysis in the CT and coronary angiography group, respectively (fig 1⇓). Patients had a mean age of 60.4 years (SD 11.4 years) and 50% were women (table 1⇓). Most patients had moderate cardiovascular risk profiles and either atypical angina pectoris or non-anginal chest pain. Among the 329 patients available for analysis, the prevalence of obstructive coronary artery disease defined by the last examination was 13% (fig 1⇑), which was relevantly lower than suggested by the 34.3% (SD 23.4%) pretest probability. The true positive rate of functional tests performed within six months before randomisation was 14% and 20% (table 1⇓). 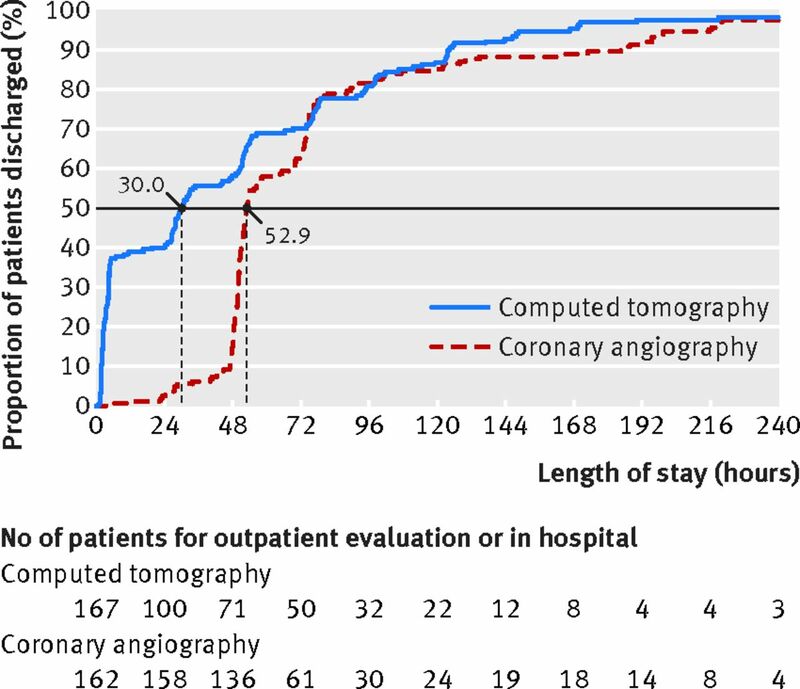 In the CT group, coronary angiography was used for determining prevalence in 24 patients. All CT examinations were deemed interpretable by both readers. Magnetic resonance imaging was conducted before coronary angiography in 17 of the 20 patients with a diagnosis of obstructive coronary artery disease by CT, whereas three patients underwent coronary angiography directly owing to metal implants (n=1) or claustrophobia (n=2). The 17 patients who underwent magnetic resonance imaging had at least 50% viable tissue in myocardial regions supplied by stenotic coronary arteries so that coronary angiography was not deferred. The median interval between CT and coronary angiography in the 22 patients who underwent both procedures (fig 1⇑) was 47 hours (interquartile range 18.7-91.6). Obstructive coronary artery disease was excluded in 88.6% of patients in the CT group (149 of 167) and 84.6% (137 of 162) in the coronary angiography group (P=0.28; fig 1⇑). Major procedural complications occurring within 48 hours of the last procedure related to CT or coronary angiography were uncommon (0.3%) and similar across groups (table 2⇓). In general, both CT and coronary angiography were safe procedures with no deaths or strokes. Only one myocardial infarction occurred in the CT group after percutaneous coronary intervention (table 2⇓). Minor procedural complications were less common in the CT group than coronary angiography group (3.6% v 10.5%, P=0.014; table 2⇓). Most of the 23 minor procedural complications were related to the puncture site of coronary angiography (haematoma or secondary bleedings) and only two were consequences of CT (table 2⇓). Cardiac CT compared with direct coronary angiography, reduced the need for coronary angiography from 100% to 14% (95% confidence interval 9% to 20%, P<0.001) and was associated with a significantly greater diagnostic yield of coronary angiography, defined as the proportion of coronary angiographies showing obstructive coronary artery disease (75% v 15%, P<0.001; table 2⇓). Also, the proportion of coronary angiographies associated with revascularisation of obstructive coronary artery disease was significantly larger in the CT group than coronary angiography group (67% v 14%, P<0.001; table 2⇓). Cardiac CT shortened the median length of stay in the coronary angiography group from 52.9 hours (interquartile range 49.5-76.4) to 30.0 hours (3.5-77.3, P<0.001; fig 2⇓). In the group of inpatients at the time of randomisation, the length of stay was not significantly reduced by CT (60.3 hours; interquartile range 32.6-98.5 v 68.0 hours; 50.2-105.8, P=0.12). 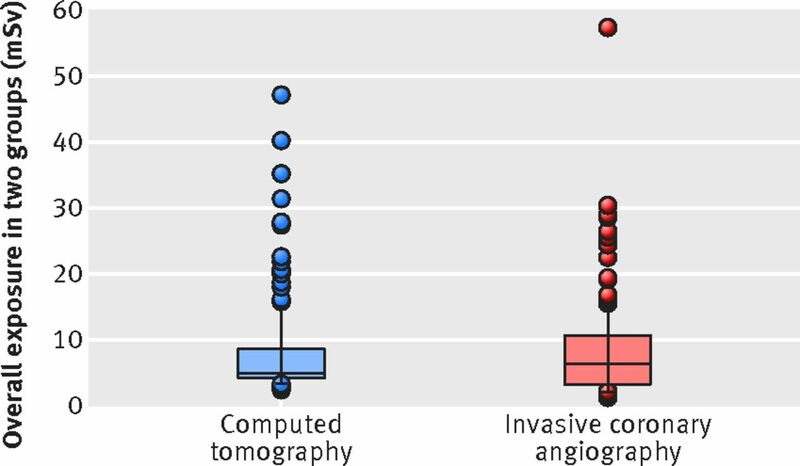 Overall median exposure to radiation, including coronary angiography and revascularisations, was similar between the CT group (5.0 mSv; interquartile range 4.2-8.7) and coronary angiography group (6.4 mSv; 3.4-10.7, P=0.45; fig 3⇓). Also, the distribution of radiation exposure was right skewed in both groups (see supplementary figure 1 in appendix B). Adding percutaneous coronary intervention to coronary angiography led to a significantly increased median effective radiation dose (see supplementary figure 2 in appendix B). 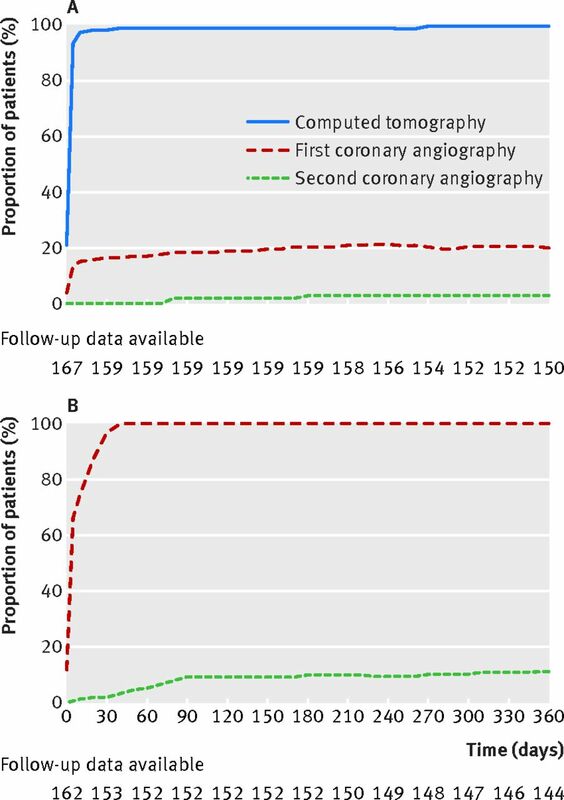 The reduction in need for coronary angiography in the CT group did not decline over time (fig 4⇓), and there was a significantly lower rate of coronary angiographies per patient during the first six months after randomisation to the CT group compared with the coronary angiography group (0.25 v 1.1, P<0.001). The cumulative relative risk adjusted for observation time for coronary angiography in the coronary angiography versus CT group was 4.2 (95% confidence interval 3.0 to 5.8, P<0.001) in the first six months and 3.1 (2.3 to 4.0, P<0.001) for the entire observation period. In the second six months after randomisation, the rate of coronary angiographies per patient did not differ between the CT group and coronary angiography group (0.027 v 0.013; fig 4⇓, relative risk 0.78, P=0.74), and from the second year of observation the relative risk was 0.81 (P=0.56). After a median follow-up of 3.3 years (interquartile range 1.3-4.6 years), MACE had occurred in seven of 167 patients in the CT group (4.2%) and six of 162 (3.7%) in the coronary angiography group (adjusted hazard ratio 0.90, 95% confidence interval 0.30 to 2.69, P=0.86). First revascularisation and re-revascularisation, at least two months after randomisation, occurred in six of 167 patients in the CT group (3.6%) and five of 162 (3.1%) in the coronary angiography group (adjusted hazard ratio 0.89, 0.27 to 2.90, P=0.84; table 2⇑). Overall, 292 of the 329 patients (89%) answered at least one question in the acceptance questionnaire. Approximately 79% of patients (219 of 278) stated that they would prefer CT for subsequent testing, whereas significantly fewer patients indicated preference for coronary angiography (7%; 20 patients, P<0.001). Of the 20 patients who preferred coronary angiography, 18 underwent the procedure (17 without and one with percutaneous intervention) and two underwent CT. Preference for CT was higher in patients in the CT group (87%; 127 of 146 patients) than in those in the coronary angiography group (70%; 92 of 132 patients, P<0.001). Most patients who preferred CT did so because they would prefer non-invasive testing in the future (n=79; 36%), and the implementation of this non-invasive testing should ideally result in a short examination time without the need for hospital admission (n=22; 10%). Among patients who preferred coronary angiography, 30% (n=6) did so because it is the established diagnostic procedure, and mostly because it enables subsequent minimally invasive treatment (n=5; 25%). In this randomised study on the risks and benefits of a non-invasive versus invasive diagnostic test, patients with a clinical indication for coronary angiography because of atypical angina or chest pain suggestive of coronary artery disease were randomised to computed tomography (CT) or coronary angiography. The study addressed the important clinical question of whether invasive coronary angiography or CT should be performed in patients with a clinical indication for coronary angiography because of an intermediate probability of coronary artery disease. CT was found to be a safe gatekeeper for invasive coronary angiography, with no increase in long term events, and patients in the CT group had fewer minor but not major procedural complications compared with those who underwent direct coronary angiography. CT was associated with a five times greater diagnostic yield of coronary angiography in the CT group, defined as the proportion of coronary angiographies showing obstructive coronary artery disease, and reduced the need for invasive coronary angiography by sevenfold indicating the potential to reduce overuse of invasive procedures.37 38 The length of stay was significantly shortened with CT, whereas exposure to radiation was similar between the groups. Patient acceptance of non-invasive CT was better than acceptance of coronary angiography. The significantly shorter length of stay in the CT group might help reduce costs when CT is used in properly selected patients with atypical presentation.39 40 Detailed analysis using data from the current and other randomised controlled trials9 11 12 41 could allow estimation of the relative cost effectiveness of CT versus invasive anatomical or functional tests for specific patient groups.42 43 44 CT resulted in a similar radiation dose in the CT group and coronary angiography group. Personalised adjustment of X-ray tube output to individual patient sizes, and novel model based iterative reconstruction might further reduce the radiation dose of CT.45 In our study, overall radiation dose was reduced by individual adjustment of anatomical coverage of CT angiography using previous coronary calcium scanning.26 27 The recent CRESCENT (Computed Tomography vs. Exercise Testing in Suspected Coronary Artery Disease) trial used a zero calcium score to exclude coronary artery disease and defer CT angiography,12 and our findings confirm the potential of this approach as only one of 71 patients with a zero calcium score had obstructive coronary artery disease (see supplementary table 2 in appendix B). Performing diagnostic tests also has psychologically mediated effects. In a randomised study, the investigators showed that even tests with no diagnostic value can reduce short term disability and increase satisfaction.46 Although the two tests performed in our study have diagnostic value, it is still likely that patients’ expectations influence disability and preference, whereas procedural complications and events are unlikely to be affected. Importantly, more than three quarters of our patients indicated a preference for CT over coronary angiography for future imaging which, according to their assessment, should ideally be performed non-invasively, over a short period, and in an outpatient setting. CT is an accurate non-invasive alternative to coronary angiography. Its conduct is well standardised in guidelines47 48 49 and based on an international survey,50 and thus there is no barrier to implementation. However, easier access to CT might result in lower thresholds for non-invasive than for invasive imaging and could thereby increase subsequent invasive procedures. This undesired effect can be avoided if cardiac CT is carefully implemented and used in the right patients and at the right time.51 Identifying the right patients is not trivial in routine practice, and our study showed that clinical approaches to estimate pretest probability17 relevantly overestimate the true prevalence of coronary artery disease in patients with atypical angina or chest pain clinically referred for invasive coronary angiography. Therefore, optimised tools for predicting the probability of obstructive coronary artery disease are clinically desired. This study was conducted at a single centre and thus the performance of CT may be different when conducted in routine clinical practice. Importantly, despite standardised implementation of CT technology in routine clinical practice,50 gaining sufficient expertise in cardiac CT takes at least 12 months.52 53 We are currently scaling up the study in a multicentric fashion in the DISCHARGE trial, and results are expected in 2020. The actual prevalence and revascularisation rates in the study were lower than assumed, resulting in largely overestimated rates for major procedural complications and an underpowered study for the predefined primary outcome, making the study inconclusive in this regard. In accordance with guidelines, most patients with suspected coronary artery disease referred for coronary angiography have typical presentation.1 23 This resulted in a long recruitment period of patients with atypical angina or chest pain referred for coronary angiography and in the interim might have resulted in changes to practice. In our population with atypical angina, no patient had more than 50% transmural extent of non-viable myocardial tissue on late enhancement magnetic resonance imaging, which thus did not result in changes to management. Coronary angiography can be performed on an outpatient basis with shorter length of stay but testing this was not feasible in our university hospital setting, where also CT was mainly done after patients had been admitted. To counterbalance this, in the calculation for length of stay we included time needed for any outpatient CT.
Our study shows that cardiac CT is a safe test to rule out coronary artery disease in patients with atypical angina or chest pain and that invasive coronary angiography is a safe procedure in patients with atypical presentation with an increase only in minor procedural complications, which is in line with a study in 61 patients.54 Importantly, CT increased the diagnostic yield of coronary angiography by a factor of five, indicating the potential to improve utilisation of resources. The diagnostic yield of 75% for coronary angiography in the CT group was similar to that in the National Cardiovascular Data Registry and higher than reported for functional tests (approximately 45%).55 CT may thus be able to act as an effective gatekeeper to the catheterisation laboratory56 and increase the reported low diagnostic yield of coronary angiography.2 Greater doctor confidence in CT findings was reported in the SCOT-Heart trial, which compared CT with standard of care including functional tests.11 Our study adds to this by showing low true positive and high true negative rates of functional tests performed within six months before randomisation. Thus, CT might be able to replace functional testing in certain patients. Our prospective study also adds to these findings by showing a reduction of unnecessary invasive coronary angiographies by CT in patients with atypical presentation referred for coronary angiography. The search is ongoing for a gatekeeper that will reliably exclude normal invasive coronary angiography. This randomised trial showed that in patients with atypical symptoms suggestive of coronary artery disease requiring coronary angiography, CT safely deferred invasive coronary angiography with no increase in long term events, reduced minor but not major procedural complications compared with direct coronary angiography, and shortened the length of hospital stay. CT was associated with reduced coronary angiography rates and increased the diagnostic yield of this procedure but did not reduce exposure to radiation. More patients preferred the coronary CT first approach. We thank all the participants; radiographic staff; referring physicians; Gert Baumann (retired chair, Department of Cardiology); Lars Brillat, Mark Beling, Jürgen Frille, Angelika Frille, Fabian Stenzel, Lisa Hartmann, Robert Haase, Daniel Preuß, Paolo Ibes, Andrea Marek, Wasiem Sanad, Thomas Frank, and Ralf Offermann, for their collaboration; Jürgen Scholze, Karl Stangl, Verena Stangl, and Yvonne Dörffel for the management of the patients; Bettina Herwig for initial copy editing; Maria Bosserdt, Hans Tepe, and Laura Elzenbeck for data management; and Wolfgang Rutsch (retired chair of our catheterisation laboratory) for his vision and support. The data safety and monitoring board: Albert de Roos (radiologist, Leiden University, Netherlands), Thomas Meinertz (cardiologist, Hamburg, Germany), and Andreas Faldum (statistician, Münster, Germany) independently reviewed all potential anonymised major and minor procedural complications and major adverse cardiovascular events blinded to the study group. Contributors: MD had the idea for the study. MD, PM, ML, and EZ designed the study. MR and PS helped in the design of the study. MD drafted the manuscript and all other authors suggested revisions of important intellectual content. MD, MR, PM, BK, SF, HD, SP, PS, MB, BH, ES, ML, and EZ analysed and interpreted the data, and revised the manuscript for important intellectual content. EZ and MD had equal contributions. MD is the guarantor. Funding: This study was funded by a grant of the Heisenberg programme of the German Research Foundation to Marc Dewey. All researchers are independent of the funding bodies. The funding bodies had no role in the study design; in the collection, analysis and interpretation of data; in the writing of the report; and in the decision to submit the manuscript for publication. Competing interests: All authors have completed the ICMJE uniform disclosure form at www.icmje.org/coi-disclosure.pdf (available on request from the corresponding author) and declare that (1) MD has support from the Heisenberg programme of the German Research Foundation for the submitted work; (2) MD has relationships with Bayer, Bracco, Cardiac MR Academy, European Commission, European Regional Development Fund, German Foundation of Heart Research, German Federal Ministry of Education and Research, GE Healthcare, Guerbet, Springer, and Toshiba; BH has relationships with Bayer, Bracco, GE, Guerbet, Philips, Siemens, and Toshiba; (3) their spouses, partners, or children have no financial relationships that may be relevant to the submitted work; and (4) have no non-financial interests that may be relevant to the submitted work. Institutional master research agreements exist with Siemens Medical Solutions, Philips Medical Systems, and Toshiba Medical Systems. The terms of these arrangements are managed by the legal department of Charité–Universitätsmedizin Berlin. Ethical approval: This study was approved by the local research ethics committee of Charité (EA-1-080-08) and the German Federal Office for Radiation Protection (Z5-22462/2-2008-048). All patients gave written informed consent before randomisation. Data sharing: Requests for patient level data will be considered by the CAD-Man trial group. Transparency: The lead author (MD) affirms that the manuscript is an honest, accurate, and transparent account of the study being reported; that no important aspects of the study have been omitted; and that any discrepancies from the study as planned (and, if relevant, registered) have been explained. Montalescot G, Sechtem U, Achenbach S, et al. Task Force Members ESC Committee for Practice Guidelines Document Reviewers. 2013 ESC guidelines on the management of stable coronary artery disease: the Task Force on the management of stable coronary artery disease of the European Society of Cardiology. Eur Heart J2013;34:2949-3003. doi:10.1093/eurheartj/eht296. pmid:23996286. Patel MR, Peterson ED, Dai D, et alLow diagnostic yield of elective coronary angiography. N Engl J Med2010;362:886-95doi:10.1056/NEJMoa0907272. Moschovitis A, Cook S, Meier B. Percutaneous coronary interventions in Europe in 2006. EuroIntervention2010;6:189-94. doi:10.4244/EIJV6I2A31. Noto TJ Jr, , Johnson LW, Krone R, et al. Cardiac catheterization 1990: a report of the Registry of the Society for Cardiac Angiography and Interventions (SCA&I). Cathet Cardiovasc Diagn1991;24:75-83. doi:10.1002/ccd.1810240202 pmid:1742788. Levenson B, Albrecht A, Göhring S, et al. QuIK-Register des Bundesverbandes Niedergelassener Kardiologen (BNK). [6th report of the German Association of Cardiologists in private practice (BNK) on quality assurance in cardiac catheterization and coronary intervention 2006–2009]. Herz2011;36:41-9. doi:10.1007/s00059-011-3423-x. pmid:21308430. 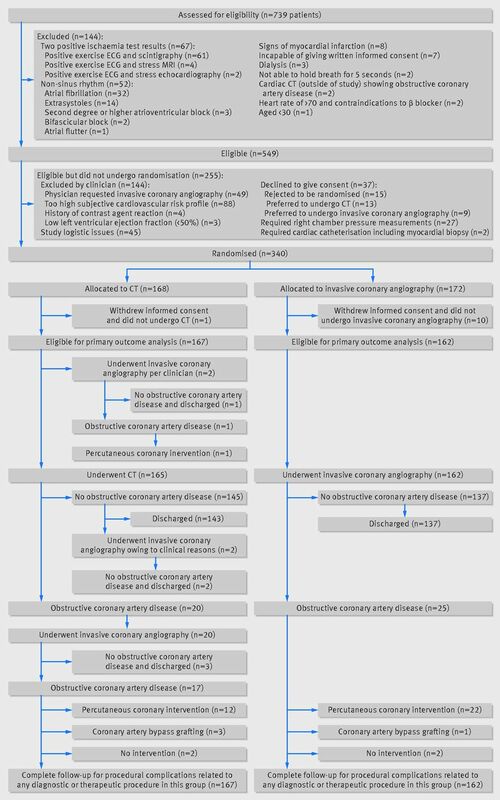 Schuetz GM, Schlattmann P, Dewey M. Use of 3x2 tables with an intention to diagnose approach to assess clinical performance of diagnostic tests: meta-analytical evaluation of coronary CT angiography studies.BMJ2012;345:e6717. doi:10.1136/bmj.e6717. pmid:23097549. Schlattmann P, Schuetz GM, Dewey M. Influence of coronary artery disease prevalence on predictive values of coronary CT angiography: a meta-regression analysis. Eur Radiol2011;21:1904-13. doi:10.1007/s00330-011-2142-2 pmid:21597986. Genders TS, Petersen SE, Pugliese F, et al. The optimal imaging strategy for patients with stable chest pain: a cost-effectiveness analysis. Ann Intern Med2015;162:474-84. doi:10.7326/M14-0027. pmid:25844996. Douglas PS, Hoffmann U, Patel MR, et al. PROMISE Investigators. Outcomes of anatomical versus functional testing for coronary artery disease. N Engl J Med2015;372:1291-300. doi:10.1056/NEJMoa1415516. pmid:25773919. Newby DE, Fox KA, Flint LL, Boon NA. A ‘same day’ direct-access chest pain clinic: improved management and reduced hospitalization. QJM1998;91:333-7doi:10.1093/qjmed/91.5.333. SCOT-HEART investigators. CT coronary angiography in patients with suspected angina due to coronary heart disease (SCOT-HEART): an open-label, parallel-group, multicentre trial. Lancet2015;385:2383-91. doi:10.1016/S0140-6736(15)60291-4. pmid:25788230. Lubbers M, Dedic A, Coenen A, et al. Calcium imaging and selective computed tomography angiography in comparison to functional testing for suspected coronary artery disease: the multicentre, randomized CRESCENT trial. Eur Heart J2016;37:1232-43. doi:10.1093/eurheartj/ehv700. pmid:26746631. Schoenhagen P, Dewey M. CT assessment of coronary artery disease: trends and clinical implications. JACC Cardiovasc Imaging2013;6:1072-4. doi:10.1016/j.jcmg.2013.07.006. pmid:24135321. Moher D, Hopewell S, Schulz KF, et al. CONSORT 2010 explanation and elaboration: updated guidelines for reporting parallel group randomised trials. BMJ2010;340:c869. doi:10.1136/bmj.c869. pmid:20332511. Schulz KF, Altman DG, Moher D, Group C. CONSORT Group. CONSORT 2010 statement: updated guidelines for reporting parallel group randomised trials. BMJ2010;340:c332. doi:10.1136/bmj.c332. pmid:20332509. Diamond GA. A clinically relevant classification of chest discomfort. J Am Coll Cardiol1983;1:574-5. doi:10.1016/S0735-1097(83)80093-X pmid:6826969. Pryor DB, Shaw L, McCants CB, et al. Value of the history and physical in identifying patients at increased risk for coronary artery disease. Ann Intern Med1993;118:81-90. doi:10.7326/0003-4819-118-2-199301150-00001 pmid:8416322. Dewey M, Rutsch W, Schnapauff D, Teige F, Hamm B. Coronary artery stenosis quantification using multislice computed tomography. Invest Radiol2007;42:78-84. doi:10.1097/01.rli.0000251569.01317.60 pmid:17220725. Simonetti OP, Kim RJ, Fieno DS, et al. An improved MR imaging technique for the visualization of myocardial infarction. Radiology2001;218:215-23. doi:10.1148/radiology.218.1.r01ja50215. pmid:11152805. Kim RJ, Wu E, Rafael A, et al. The use of contrast-enhanced magnetic resonance imaging to identify reversible myocardial dysfunction. N Engl J Med2000;343:1445-53. doi:10.1056/NEJM200011163432003. pmid:11078769. Perk J, De Backer G, Gohlke H, et alEuropean Guidelines on cardiovascular disease prevention in clinical practice (version 2012): The Fifth Joint Task Force of the European Society of Cardiology and Other Societies on Cardiovascular Disease Prevention in Clinical Practice (constituted by representatives of nine societies and by invited experts). Developed with the special contribution of the European Association for Cardiovascular Prevention & Rehabilitation (EACPR). Eur Heart J2012;33:1635-701. doi:10.1093/eurheartj/ehs092. Chow BJ, Small G, Yam Y, et al. CONFIRM Investigators. Prognostic and therapeutic implications of statin and aspirin therapy in individuals with nonobstructive coronary artery disease: results from the CONFIRM (COronary CT Angiography EvaluatioN For Clinical Outcomes: An InteRnational Multicenter registry) registry. Arterioscler Thromb Vasc Biol2015;35:981-9. doi:10.1161/ATVBAHA.114.304351. pmid:25676000. Windecker S, Kolh P, Alfonso F, et al. Authors/Task Force members. 2014 ESC/EACTS Guidelines on myocardial revascularization: The Task Force on Myocardial Revascularization of the European Society of Cardiology (ESC) and the European Association for Cardio-Thoracic Surgery (EACTS)Developed with the special contribution of the European Association of Percutaneous Cardiovascular Interventions (EAPCI). Eur Heart J2014;35:2541-619. doi:10.1093/eurheartj/ehu278. pmid:25173339. Dewey M, Zimmermann E, Deissenrieder F, et al. Noninvasive Coronary Angiography by 320-Row CT with Lower Radiation Exposure and Maintained Diagnostic Accuracy: Comparison of Results with Cardiac Catheterization in a Head-To-Head Pilot Investigation. Circulation2009;120:867-75. Circulation2009;120:867-75. doi:10.1161/CIRCULATIONAHA.109.859280 pmid:19704093. Dewey M, Laule M, Krug L, et al. Multisegment and halfscan reconstruction of 16-slice computed tomography for detection of coronary artery stenoses. Invest Radiol2004;39:223-9. doi:10.1097/01.rli.0000115201.27096.6e pmid:15021326. Leschka S, Kim CH, Baumueller S, et al. Scan length adjustment of CT coronary angiography using the calcium scoring scan: effect on radiation dose. AJR Am J Roentgenol2010;194:W272-7. doi:10.2214/AJR.09.2970 pmid:20173126. Zimmermann E, Dewey M. Whole-heart 320-row computed tomography: reduction of radiation dose via prior coronary calcium scanning. Rofo2011;183:54-9. doi:10.1055/s-0029-1245629. pmid:20725881. Gottlieb I, Miller JM, Arbab-Zadeh A, et al. The absence of coronary calcification does not exclude obstructive coronary artery disease or the need for revascularization in patients referred for conventional coronary angiography. J Am Coll Cardiol2010;55:627-34. doi:10.1016/j.jacc.2009.07.072 pmid:20170786. Huda W, Ogden KM, Khorasani MR. Converting dose-length product to effective dose at CT. Radiology2008;248:995-1003. doi:10.1148/radiol.2483071964 pmid:18710988. Leung KC, Martin CJ. Effective doses for coronary angiography. Br J Radiol1996;69:426-31. doi:10.1259/0007-1285-69-821-426 pmid:8705181. Ladenheim ML, Pollock BH, Rozanski A, et al. Extent and severity of myocardial hypoperfusion as predictors of prognosis in patients with suspected coronary artery disease. J Am Coll Cardiol1986;7:464-71. doi:10.1016/S0735-1097(86)80454-5 pmid:3950226. Schönenberger E, Schnapauff D, Teige F, Laule M, Hamm B, Dewey M. Patient acceptance of noninvasive and invasive coronary angiography. PLoS One2007;2:e246. doi:10.1371/journal.pone.0000246 pmid:17327910. Cox DR. Regression Models and Life-Tables. J R Stat Soc B1972;34:187-220. Napp A, Haase R, Laule M, et al. Computed Tomography versus Invasive Coronary Angiography: Design and Methods of the Pragmatic Randomised Multicentre DISCHARGE Trial. Eur Radiol2016; in press. Braunwald E. Unstable angina. A classification. Circulation1989;80:410-4. doi:10.1161/01.CIR.80.2.410 pmid:2752565. Thygesen K, Alpert JS, Jaffe AS, et al. Joint ESC/ACCF/AHA/WHF Task Force for Universal Definition of Myocardial Infarction Authors/Task Force Members Chairpersons Biomarker Subcommittee ECG Subcommittee Imaging Subcommittee Classification Subcommittee Intervention Subcommittee Trials & Registries Subcommittee Trials & Registries Subcommittee Trials & Registries Subcommittee Trials & Registries Subcommittee ESC Committee for Practice Guidelines (CPG) Document Reviewers. Third universal definition of myocardial infarction. J Am Coll Cardiol2012;60:1581-98. doi:10.1016/j.jacc.2012.08.001. pmid:22958960. Hurley R. Can doctors reduce harmful medical overuse worldwide?. BMJ2014;349:g4289. doi:10.1136/bmj.g4289. pmid:24993249. Lenzer J. Choosing Wisely: setbacks and progress. BMJ2015;351:h6760. doi:10.1136/bmj.h6760. pmid:26671897. Dewey M, Hamm B. Cost effectiveness of coronary angiography and calcium scoring using CT and stress MRI for diagnosis of coronary artery disease. Eur Radiol2007;17:1301-9. doi:10.1007/s00330-006-0439-3. pmid:17031453. Genders TS, Meijboom WB, Meijs MF, et alCT coronary angiography in patients suspected of having coronary artery disease: decision making from various perspectives in the face of uncertainty. Radiology2009;253:734-44. doi:10.1148/radiol.2533090507. Hamilton-Craig C, Fifoot A, Hansen M, et al. Diagnostic performance and cost of CT angiography versus stress ECG--a randomized prospective study of suspected acute coronary syndrome chest pain in the emergency department (CT-COMPARE). Int J Cardiol2014;177:867-73. doi:10.1016/j.ijcard.2014.10.090. pmid:25466568. Winkens R, Dinant GJ. Evidence base of clinical diagnosis: Rational, cost effective use of investigations in clinical practice. BMJ2002;324:783. doi:10.1136/bmj.324.7340.783 pmid:11924663. Agus AM, McKavanagh P, Lusk L, et al. The cost-effectiveness of cardiac computed tomography for patients with stable chest pain. Heart2016;102:356-62. doi:10.1136/heartjnl-2015-308247. pmid:26769552. Thom H, West NE, Hughes V, et al. CECaT study group. Cost-effectiveness of initial stress cardiovascular MR, stress SPECT or stress echocardiography as a gate-keeper test, compared with upfront invasive coronary angiography in the investigation and management of patients with stable chest pain: mid-term outcomes from the CECaT randomised controlled trial. BMJ Open2014;4:e003419. doi:10.1136/bmjopen-2013-003419. pmid:24508847. Sox HC Jr, , Margulies I, Sox CH. Psychologically mediated effects of diagnostic tests. Ann Intern Med1981;95:680-5. doi:10.7326/0003-4819-95-6-680 pmid:7305144. Halliburton SS, Abbara S, Chen MY, et al. SCCT guidelines on radiation dose and radiation dose-optimization strategies in cardiovascular CT. J Cardiovasc Comput Tomogr2011;5:198-224. Hoffmann U, Akers SR, Brown RK, et al. ACR Appropriateness Criteria Acute Nonspecific Chest Pain-Low Probability of Coronary Artery Disease. J Am Coll Radiol2015;12(12 Pt A):1266-71. doi:10.1016/j.jacr.2015.09.004. pmid:26653833. Taylor AJ, Cerqueira M, Hodgson JM, et al. American College of Cardiology Foundation Appropriate Use Criteria Task Force Society of Cardiovascular Computed Tomography American College of Radiology American Heart Association American Society of Echocardiography American Society of Nuclear Cardiology North American Society for Cardiovascular Imaging Society for Cardiovascular Angiography and Interventions Society for Cardiovascular Magnetic Resonance. ACCF/SCCT/ACR/AHA/ASE/ASNC/NASCI/SCAI/SCMR 2010 appropriate use criteria for cardiac computed tomography. A report of the American College of Cardiology Foundation Appropriate Use Criteria Task Force, the Society of Cardiovascular Computed Tomography, the American College of Radiology, the American Heart Association, the American Society of Echocardiography, the American Society of Nuclear Cardiology, the North American Society for Cardiovascular Imaging, the Society for Cardiovascular Angiography and Interventions, and the Society for Cardiovascular Magnetic Resonance. J Am Coll Cardiol2010;56:1864-94. doi:10.1016/j.jacc.2010.07.005. pmid:21087721. Maurer MH, Zimmermann E, Schlattmann P, Germershausen C, Hamm B, Dewey M. Indications, imaging technique, and reading of cardiac computed tomography: survey of clinical practice. Eur Radiol2012;22:59-72. doi:10.1007/s00330-011-2239-7. pmid:21845461. Chow BJ, Abraham A, Wells GA, et al. Diagnostic accuracy and impact of computed tomographic coronary angiography on utilization of invasive coronary angiography. Circ Cardiovasc Imaging2009;2:16-23. doi:10.1161/CIRCIMAGING.108.792572. pmid:19808560. Pugliese F, Hunink MG, Gruszczynska K, et al. Learning curve for coronary CT angiography: what constitutes sufficient training?. Radiology2009;251:359-68. doi:10.1148/radiol.2512080384. pmid:19401570. Chin S, Ong T, Chan W, et al. 64 row multi-detector computed tomography coronary image from a centre with early experience: first illustration of learning curve. J Geriatr Cardiol2006;3:29-34. Andreini D, Pontone G, Pepi M, et al. Diagnostic accuracy of multidetector computed tomography coronary angiography in patients with dilated cardiomyopathy. J Am Coll Cardiol2007;49:2044-50. doi:10.1016/j.jacc.2007.01.086. pmid:17512361. Patel MR, Dai D, Hernandez AF, et alPrevalence and predictors of nonobstructive coronary artery disease identified with coronary angiography in contemporary clinical practice. Am Heart J2014;167:846-52.doi:10.1016/j.ahj.2014.03.001. Patel N, Pal RS, Flores F, Budoff M. Utility of cardiac computed tomography angiography to exclude clinically significant obstructive coronary artery disease in patients after myocardial perfusion imaging. Am J Cardiol2012;109:165-8. doi:10.1016/j.amjcard.2011.08.022. pmid:22000776.